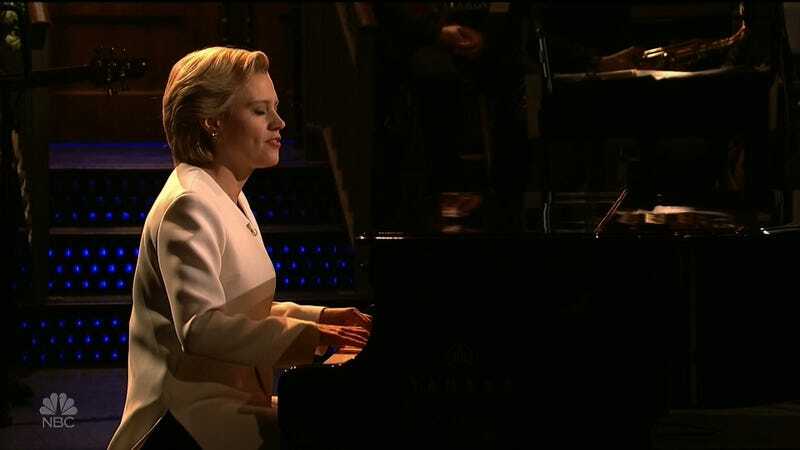 SNL Cold Open: Kate McKinnon, Playing Leonard Cohen's "Hallelujah"
Tonight’s Saturday Night Live cold open brought new meaning to the term, as longtime cast member Kate McKinnon—who, until Tuesday, presumed to be playing President Clinton for the next four years—performed a solo rendition of “Hallelujah” by Leonard Cohen, who died at 82 earlier this week. It was an odd opening to an already-odd show, one featuring the returns of Dave Chappelle and A Tribe Called Quest. SNL Lampoons Cam Newton & Peyton Manning&apos;s "Ebony And Ivory"